The days of simply buying a package of cheese from the refrigerated section of your local grocery store are also a thing of the past. Sure, you can still do that, but more and more grocery stores have a dedicated cheese section and may even have a cheesemonger who will sell you the cheese. You can likely expect to pay a higher price in the cheese section, but also keep in mind, you’re getting a higher quality cheese as well. Dorsey Culinary Academy Recognizes National Cheese Lover’s Day! The uses and pairings of cheese have also evolved over the years, which has added to our modern day cheese craze! Historically, wine has been a popular pairing with fine cheeses (and it continues to be). In addition, craft beers have also become a new popular accompaniment for cheese. Nuts, crackers, breads, various meets and charcuterie, preserves, chutneys and pastes, condiments, and pickled vegetables remain as other potential pairings with cheese. During the presentation, students also had the opportunity to learn about the cheesemaking process in Wisconsin. Below we’ve outlined the 8 steps in the process, but you can also learn more about them through this video, The Art of Cheesemaking. Some Fun Facts About Wisconsin Cheese! Wisconsin has 15 million acres of Farmland! 90% of the milk in Wisconsin goes into making quality, award-winning cheeses! Wisconsin is home to nearly 20% of the nation’s dairy farms – the largest number of dairy farms in the US! Wisconsin cheese makers produce over 600 varieties, styles, and types of cheeses. Wisconsin has won more world-champion cheese awards than any other state or nation – WOW! All Wisconsin cheese is made under the guidance of a licensed cheesemaker. 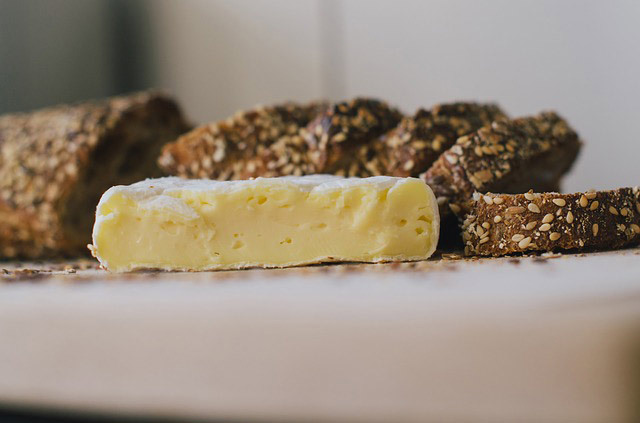 Licensed cheesemakers are required to learn both the standards and the artistry of Wisconsin cheeses (and what sets them apart as world-class cheeses). The Wisconsin Milk Marketing Board is a non-profit organization funded entirely by Wisconsin's dairy farm families. The goal of WMMB is to increase the sale and consumption of Wisconsin milk and dairy products. WMMB was formed in 1983 when Wisconsin dairy farmers voted to establish a milk marketing order. For every 100 pounds of milk produced and marketed in the state, ten cents goes to WMMB to promote dairy products produced in the state of Wisconsin. In addition, an additional five cents goes to the National Dairy Promotion & Research Board for generic dairy promotion activities at the national level. WMMB’s mission is to "help grow the demand for Wisconsin milk by providing programs that enhance the competitiveness of the state's dairy industry:" The organization serves several key roles within Wisconsin’s booming dairy industry including: working to establish new markets, funding dairy-related research, educating consumers about the quality and nutritional importance of Wisconsin milk and dairy products, and showcasing the important economic contribution that dairy makes to Wisconsin communities and the state of Wisconsin. WMMB provides a variety of resources not only for the people of Wisconsin, but for cheese enthusiasts around the globe! You can check out their website at http://www.eatwisconsincheese.com/ as well as some of the specialty sites including Cheese and Burger Society (www.Cheeseandburger.com), Grilled Cheese Academy (www.grilledcheeseacademy.com), and All Things Mac & Cheese (www.allthingsmacandcheese.com). Are you ready to turn up the heat on a new career in the culinary field? Dorsey Schools has the ingredients that can help you succeed in launching your new culinary career. Dorsey Culinary Academy provides a perfectly blended career training program that is designed to help students launch their careers in the culinary industry. Students in the Culinary Arts program will “learn by doing” while being exposed to the practical side of professional food preparation. The Culinary Arts program also includes an externship component during the last module that is designed to provide students with hands-on industry-specific experience that models real world occupational settings. Students enrolled in the Culinary Arts program will also have access to professional culinary equipment as part of their training in our industry-current kitchens on campus at Dorsey Schools. Topics covered during the program include (but are not limited to) proper sanitation, knife cuts, “mise en place,” cooking techniques, food preparation, food purchasing/specifications, catering, baking, butchering, nutrition and healthy cooking, menu planning & pricing, inventory control, and professionalism. The Dorsey Schools Culinary Arts program is programmatically accredited by The Accrediting Commission of the American Culinary Federation Education Foundation (ACFEF). Each graduate of the Culinary Arts Program at Dorsey Schools is eligible to become an ACF certified culinarian with documentation of both membership in the ACF and one year of in-field working experience. If you’re ready to embark on an exciting new career in the culinary industry, Dorsey schools can help you. Get started today by learning more about the Culinary Arts program at Dorsey by calling 888-422-1188 or you can request information online. Previous PostWhat Are Some HVAC Jobs Available?